So, the latest time-wasting trend to sweep Facebook (as if you’re not wasting enough time if you’re on Facebook in the first place) is Candy Crush Saga. I resisted for months because I already played Bejeweled Blitz and who needs another time-sucking game? Then my kids spent a week with their dad and it rained all week, so rather than being anything remotely resembling productive, I read books and played computer games all week. In other words, I took a vacation. I was so bored “vacationing” that I started playing Candy Crush Saga. Apparently some kid is trying to help unicorns and bunnies and dragons. Who cares about all that stuff? 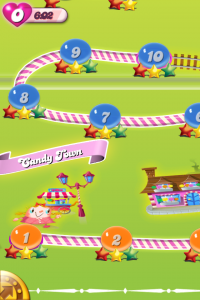 Let’s talk about the real saga of Candy Crush. First, you start playing and it’s all so easy, and you can’t figure out what your friends are talking about. You replay levels just so you can get three stars. Woo hoo! I got three stars!